We Won't Be Calling It Obamacare in 2045. How About 'Americare'? Let's get a couple of things straight. I'm not talking about a new name for Obamacare because its actual contents are more popular than the name itself, which is what Kathleen Sebelius (remember her?) said last December when she suggested that the program needs rebranding. I'm simply thinking long-term. Who knows what our healthcare system will look like in 2045? I'd like to think we'd have some form of single-payer, universal coverage. But let's say we don't, and that we still have some version of the healthcare exchanges, the premium subsidies for lower-income Americans, and the other basic elements of healthcare reform contained in the Affordable Care Act. Could you imagine, 30 years after President Obama left office, that people will still be talking about getting health insurance through "Obamacare"? Anyone who has read my posts knows that I think this president has had a strongly positive impact on our country's direction, so it's not like I'd be offended to do so. It would just be, well, odd. There is a part of me that would like to see the name continued, if only to remind people just who is responsible for the benefits they are receiving. But to be realistic, having a program in 2045 whose name references a president first elected in 2008 would just sound dated, old-fashioned, like yesterday's news. In the 2012 campaign, on the other hand, I thought it was brilliant for the president to reclaim the name "Obamacare" from his Republican opponents. For example, a month before the election, he turned the tables on them, declaring, "They call it 'Obamacare'? I do care! 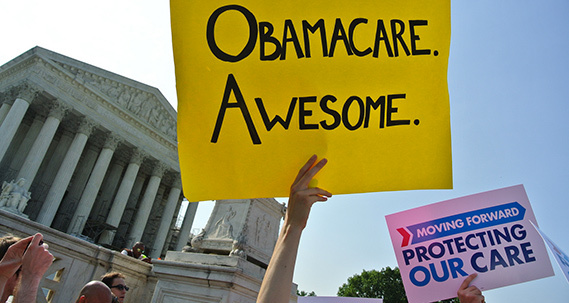 You should care too," and adding latter the same day, "Folks go around saying 'Obamacare.' That's right: I care. That's their main agenda? That's your plank? .... Making sure 30 million people don't have health insurance?" He was rightfully proud to embrace his signature domestic policy achievement. "Americare" may not be original, but the name parallels "Medicare" as well as "Obamacare," so it will be easy for people to both remember and associate with health care. Most importantly in terms of impact, such a name change allows the program to transcend its partisan origins. Someday, red states will accept the Medicaid expansion authorized by the law, but it will be easier for them to do so if they have another name by which to call it. ("The Affordable Care Act" isn't catchy enough either, even though that's the law's actual name.) The people who'll benefit won't mind, and I suspect President Obama won't either. The time to do this is now, so that some future president won't have to. It would be especially awkward for another Democratic president to make the change, thus giving the talking heads -- not to mention Republicans -- the chance to accuse him or her of insulting President Obama's legacy. Instead, Obama can just humbly announce the change by talking about how healthcare reform is bigger than one person. He can do so in the context of a larger address laying out all the ways in which the law has succeeded. The five-year anniversary of the law's passage would have been a great opportunity to announce a name change, but there will be others. Whenever it makes the announcement, the White House can follow up by putting the word "Americare" all over the place at Healthcare.gov and making sure that every member of the administration as well as every elected Democrat and party official starts using the new name. Certainly, if Republicans can be organized enough to all refer to the "Democrat Party," Democrats can figure out how to use the name "Americare." This law isn't going anywhere. Republican Alf Landon ran against FDR in 1936 calling for the repeal of Social Security. He got crushed, and four years later, Republican nominee Wendell Willkie called instead for expanding it. While I don't know that something exactly like that will ever happen with Obamacare -- oops, I mean Americare -- the Republican Party will never succeed in repealing it, even if calls for repeal remain red meat for the right-wing base into the foreseeable future. So the law will be around. Forget 2045. Think about 2095. In that year, Obamacare will be older than Social Security is now. I can't imagine talking about our "FDR pensions" or something like that, can you? I hope we have improved our healthcare system significantly by that date. I hope the for-profit healthcare industry has gone the way of the Edsel. But whatever system we have, it will need to be called something. I like "Americare."